Thailand has sent heavily-armed troops to reinforce positions along the Burma border after an influx of ethnic Karen refugees fleeing an army offensive. More than 4,000 people have fled Burma for Thailand in the largest influx of refugees in the area for a decade. Karen rebels have been fighting the central government for 60 years, in the world's longest-running civil war. Over the last three years the Burmese military has driven the rebels back to a few small bases along the border. 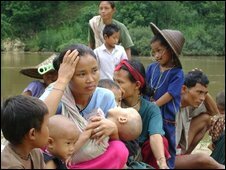 The long war along Burma's forested eastern border has caused immense human suffering, with an estimated 500,000 ethnic Karen forced from their homes. Most of those who fled into Thailand over the past week had already been displaced, and were living at a camp inside Burma when it was repeatedly shelled by Burmese army mortars. Fighters from the Karen National Union (KNU) say they are holding their ground - but they are heavily outnumbered by the joint forces of the Burmese army and a Karen splinter group which is allied to the government. The KNU has steadily retreated over the decades, from its position of greatest strength right after Burma's independence in 1948 when it came close to capturing Rangoon, to its situation today, with just a few bases along the border. Its strength has been sapped recently by a string of defections, and by the assassination of its most charismatic leader in Thailand last year. The Thai government has tried to start a dialogue between the two sides this year, so far with little success. The 4,000 new arrivals will join around 100,000 other Karen who have sought shelter in Thailand. Most are confined to squalid camps, which the Thai authorities do not allow them to leave. Some have lived in these camps for more than a decade.